Chrysanthemum is the common name and genus name for a group of erect, herbaceous perennial plants in the flowering plant family Asteraceae (aster, daisy or sunflower family), generally characterized by aromatic, deeply lobed, alternate leaves and often large and showy flowers. The term also is used for the flower head of any of these plants, many of which are cultivated as ornamentals. Cultivated species often are called mums and these tend to have large, radiate flower heads versus smaller flower heads in wild species. Chrysanthemums have been treasured by humans for thousands of years, being cultivated in China over 3,000 years ago and reaching the importance of serving as the floral symbol of the Japanese imperial family. The various elements of a chrysanthemum—its rich colors, the feel of its petals, the fragrance of its smell, and so forth—provide a value for human beings through bringing pleasure through its beauty, while at the same time advancing the individual purpose of the chrysanthemum by promoting its survival. And, since beauty is not perceived in monotony, but in variety and difference, humans have further developed even these elements, both by adding the human presence (giving chrysanthemums, displaying them, etc.) and by creating new varieties of chrysanthemums. 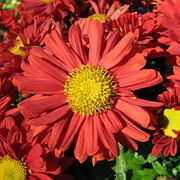 The family Asteraceae or Compositae, to which Chrysanthemum belongs, is known as the aster, daisy, or sunflower family. It is the largest family of flowering plants in terms of number of species. According to the Royal Botanical Gardens of Kew, the family comprises more than 1,600 genera and 23,000 species. The name "Asteraceae" is derived from the type genus Aster and refers to the star-shaped flower head of its members, epitomized well by the daisy. "Compositae," an older but still valid name (McNeill et al. 2006), means "composite" and refers to the unique inflorescence (described below). Asteraceae is a taxon of dicotyledonous flowering plants. In addition to the chrysanthemum and daisy, other well-known members of the family include lettuce, chicory, globe artichoke, safflower, dandelion, ragwort, and sunflower. The genus Chrysanthemum contains about 30 species of plants native to Asia and northeastern Europe. The genus once included many more species, but was split several decades ago into several genera; the naming of the genera has been contentious, but a ruling of the International Code of Botanical Nomenclature in 1999 resulted in the defining species of the genus being changed to Chrysanthemum indicum, thereby restoring the economically important florist's chrysanthemum to the genus Chrysanthemum. These species were, after the splitting of the genus but before the ICBN ruling, commonly treated under the genus name Dendranthema. The other species previously treated in the narrow view of the genus Chrysanthemum are now transferred to the genus Glebionis. The other genera split off from Chrysanthemum include Argyranthemum, Leucanthemopsis, Leucanthemum, Rhodanthemum, and Tanacetum. The species of Chrysanthemum are herbaceous perennial plants growing to 50–150 centimeters tall, with deeply lobed leaves and large flowerheads, which are white, yellow, or pink in the wild species. As with Asteraceae in general, Chrysanthemum blooms are composed of many individual flowers (florets), each one capable of producing a seed. Some species and hybrids have only disc florets in the flower head, while others have both ray and disc florets. The ray florets are considered imperfect flowers, as they only possess the female productive organs, while the disk florets are considered perfect flowers as they possess both male and female reproductive organs. Chrysanthemums were cultivated in China as a flowering herb as far back as the fifteenth century B.C.E. An ancient Chinese city was named Ju-Xian, meaning "chrysanthemum city." The chrysanthemum today is one of the "Four Junzi Flowers" (四君子) of China (the others being ume, orchid, and bamboo), known in Chinese as jú (菊). The chrysanthemum was introduced into Japan probably in the eighth century C.E., and the Emperor adopted the flower as his official seal. The chrysanthemum (菊 kiku in Japanese) is the monshō ("badge" or "crest") of the emperor of Japan today, and therefore the flower represents the emperor and Imperial House. 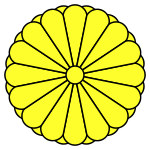 The term kikukamonshō literally means the "Chrysanthemum Crest" (Imperial Seal). The Imperial Seal of Japan is used by members of the Japanese imperial family. However, under the Meiji Constitution, no one is permitted to use the Imperial Seal except the Emperor of Japan. Thus, historically, each member of the imperial family has used a slightly modified version of the seal. Shinto shrines either displayed the imperial seal or incorporated elements of the seal into their own emblems. The symbol is a yellow or orange chrysanthemum with black or red outlines and background. A central disc is surrounded by a front set of 16 petals. A rear set of 16 petals are half staggered in relation to the front set and are visible at the edges of the flower. An example of the chrysanthemum being used is in the badge for the Order of the Chrysanthemum. The Supreme Order of the Chrysanthemum is a Japanese honor awarded by the emperor. A chrysanthemum appearing in a commoner's mon, or traditional heraldic crest, would feature 17 petals. Other members of the imperial family use a version with 14 single petals, while a form with 16 single petals is used for Diet members' pins, orders, passports, etc. The Chrysanthemum Throne (Japanese: 菊花紋章, kikukamonshō or kikkamonshō) is the English term given to the Imperial Throne of Japan. In Japanese, it is simply called the Imperial Throne (Japanese: kōi or 皇位). As of 2008, the emperor is His Imperial Majesty the Emperor Akihito, who has been on the Chrysanthemum Throne since his father Emperor Shōwa (Hirohito) died in 1989. The flower was brought to Europe in the seventeenth century. Linnaeus named it from the Greek prefix chrys-, which means golden (the color of the original flowers), and -anthemon, meaning flower. 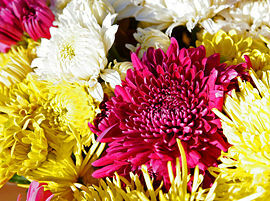 Cultivated chrysanthemums can be yellow, white, or even bright red, such as these. The flowers of chrysanthemums occur in various forms, and can be daisy-like, decorative, pompons, or buttons. This genus contains many hybrids and thousands of cultivars developed for horticultural purposes. In addition to the traditional yellow, other colors are available, such as white, purple, and red. The most important commercial hybrid is Chrysanthemum × morifolium (syn. C. × grandiflorum), derived primarily from C. indicum but also involving other species. 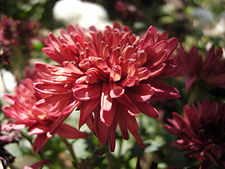 Chrysanthemums are broken into two basic groups, garden hardy and exhibition. Garden hardy mums are perennials capable of being wintered over in the ground in most northern latitudes. Exhibition varieties are not usually as sturdy. Garden hardies are defined by their ability to produce an abundance of small blooms with little if any mechanical assistance (i.e., staking) and withstanding wind and rain. Exhibition varieties on the other hand require staking and over-wintering in a relatively dry cool environment, sometimes with the addition of night lights. The exhibition varieties can be used to create many amazing plant forms; Large disbudded blooms, spray forms, as well as many artistically trained forms, such as: Thousand Bloom, Standard (trees), Fans, Hanging Baskets, Topiary, Bonsai, and Cascades. Chrysanthemum blooms are divided into 13 different bloom forms by the US National Chrysanthemum Society, which is in keeping with the international classification system. The bloom forms are defined by the way in which the ray and disc florets are arranged. In some varieties, the disc florets are completely concealed, while in others the disc flowers are completely exposed. Irregular Incurve: These are the giants of the chrysanthemum world. Quite often disbudded to create a single giant bloom (ogiku), the disc florets are completely concealed, while the ray florets curve inwardly to conceal the disc and also hang down to create a "skirt." Also called, "japs." Reflex: The disc florets are concealed and the ray florets reflex outwards to create a mop like appearance. Regular Incurve: Similar to the irregular incurves, only usually smaller blooms, with nearly perfect globular form. Disc florets are completely concealed. They used to be called "Chinese." 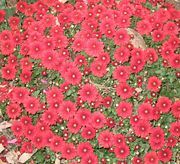 Decorative: Similar to reflex blooms without the mop like appearance. Disc florets are completely concealed, ray florets usually do not radiate at more than a 90 degree angle to the stem. Intermediate Incurve: These blooms are in-between the Irregular and Regular incurves in both size and form. They usually have broader florets and a more loosely composed bloom. Again, the disc florets are completely concealed. Pompon: The blooms are fully double, of small size, and almost completely globular in form. Note the spelling, it is not pompom. Single/Semi-Double: These blooms have completely exposed disc florets, with between one and seven rows of ray florets, usually radiating at not more than a 90 degree angle to the stem. Anemone: The disc florets are prominently featured, quite often raised and overshadowing the ray florets. Spoon: The disc florets are visible, and the ray florets are spatulate. Quill: The disc florets are completely concealed, and the ray florets are tube like. Spider: The disc florets are completely concealed, and the ray florets are tube like with hooked or barbed ends, hanging loosely around the stem. Brush & Thistle: The disc florets may be visible. The ray florets are often tube like, and project all around the flower head, or project parallel to the stem. Exotic: These blooms defy classification as they possess the attributes of more than one of the other twelve bloom types. Chrysanthemum leaves so closely resemble its relative, the mugwort weed, that mugwort is sometimes called wild chrysanthemum. In some countries of Europe (e.g., France, Poland), in Korea, and in Japan, white chrysanthemums are symbolic of death and are only used for funerals or on graves. In China, white chrysanthemums are symbolic of lamentation. Yellow or white chrysanthemum flowers are boiled to make a sweet drink in some parts of Asia. The resulting beverage is known simply as "chrysanthemum tea" (pinyin: júhuā chá, in Chinese). Chrysanthemum tea is used for some medicinal purposes, including an aid in recovery from influenza. In Korea, a rice wine flavored with chrysanthemum flowers is called gukhwaju (국화주). Chrysanthemum plants have been shown to reduce indoor air pollution by the NASA Clean Air Study (Wolverton et al. 1984). This flower is called Oogiku in Japanese. That means "big chrysanthemum." The size of this flower is around 200mm. McNeill, J. et al. 2006. International Code of Botanical Nomenclature International Association of Plant Taxonomy (IAPT). Retrieved April 11, 2008. Wolverton, B. C., R. C. McDonald, and E. A. Watkins. 2004. Foliage plants for removing indoor air pollutants from energy-efficient homes Economic Botany 34: 224-228. Retrieved April 11, 2008. This page was last modified on 21 February 2017, at 16:06.